Eyeshadows: very pigmented, soft, blendable. It stays on all day without smudging or smearing. It doesn't fade either. So, its the perfect eyeshadow for brides as it will stay put and doesn't need retouching. Shade #126 light beige with shimmer for highlighting. Shade #4 very black shade for accentuating your eyes. Profinish powder foundation: 118 is darker than 120 in this powder version! I am an NC20-25 so I wear shades #118 and #120 in MUFE HD foundation.However, what I usually know that powder foundations are usually a shade or two darker than the liquid version of the brand. Therefore, I thought that since in the HD foundation #118 is a hint lighter than my natural shade, then it will match my shade in this powder version, I was wrong! #118 in the Profinish powder foundation is DARKER at least with two grades than #118 in HD foundation for some reason I don't know of. So purchasing this foundation online and picking the shade without trying it out before purchase can be quite tricky. Other than that, the Profinish foundation is the THING! It is extremely soft, buildable without caking, very natural results, doesn't have the mask effect. It's also a multi-purpose product. As stated by the brand: It can be used wet for light to medium coverage or dry for heavy coverage, according to your need. It is perfect for all skin types, although I wouldn't reccomend it for very dry skin unless you are going to use it wet. It doesn't cause breakouts or dryness. 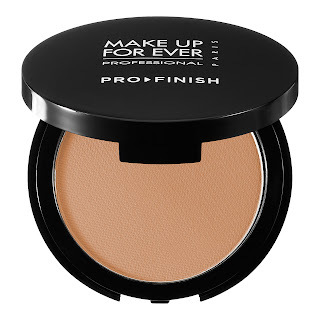 The finish it gives is great coverage, and yet LIGHT, natural, breathable, with a glowy finish. HD liquid foundation: Very transparent appearance with extremely high coverage without clogging the pores. Light weight on your skin that you almost forget you are wearing foundation. Very blendable and buildable. It stays on for a very long time. Perfect for dry to combined skin. It would suit slightly oily skin too but with powder retouching every couple of hours. Not for oily skin at all. Its my Holy Grail! I highly recommend it.